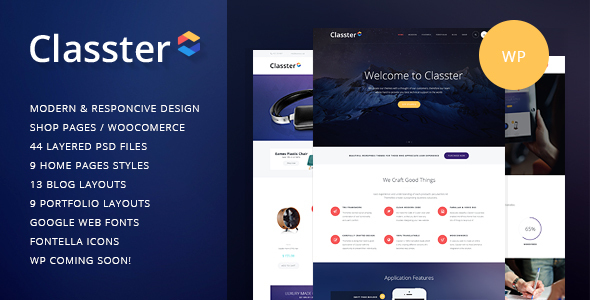 Classter is a premium, responsive, refined Multi-Purpose WordPress theme. It is made for corporate and business websites. It’s perfect for law firm, financial company, tax consulting bureau, accounting services solutions, strategy planning, web and creative agency, economist analytics & startup company. Also it fits financial adviser, freelancer, lawyer, business coach blog, marketing and advertising services & analysis, for financial and investment consulting, shop, store etc. Classter is made compatible with WPBakery (aka Visual Composer, which we think is better than Elementor), WPML, Woocommerce, Revolution Slider. Professionally designed and beautifully coded theme is a great deal for your future website. The theme is quite versatile and fits lots of different businesses. - Layout of shortcode [trx_form_item] is fixed (Form item - custom field). - Minor fixes in comment form fields layout. - Layout of shortcode [trx_gap] is fixed. - Minor fixes in some shortcodes layout. - Compatibility with VC latest versions is improved. - Plugins included into the theme, updated to their latest versions. - New parameter "Active column" is added to the shortcode "Price table item". The parameter allows to make the column active without hovering over it.